Early photograph of a New York and Harlem Railroad horsecar. 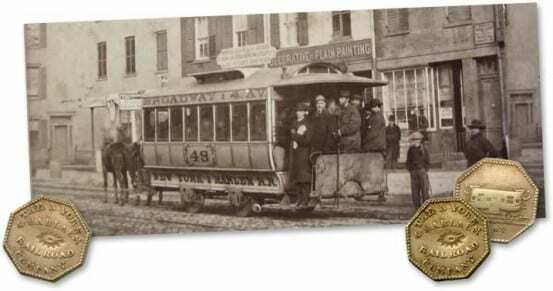 New York & Harlem transfer tokens from the American Numismatic Society. 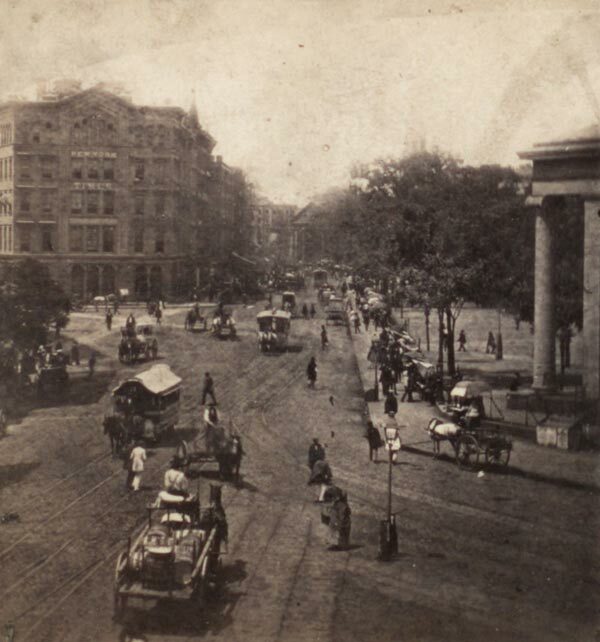 One of the New York & Harlem’s earliest stations in Manhattan was at Tryon Row, a street that no longer exists. At the time the “trains” were being pulled by horses, and there were short cars – pulled by two horses, and longer cars – pulled by four or more horses. 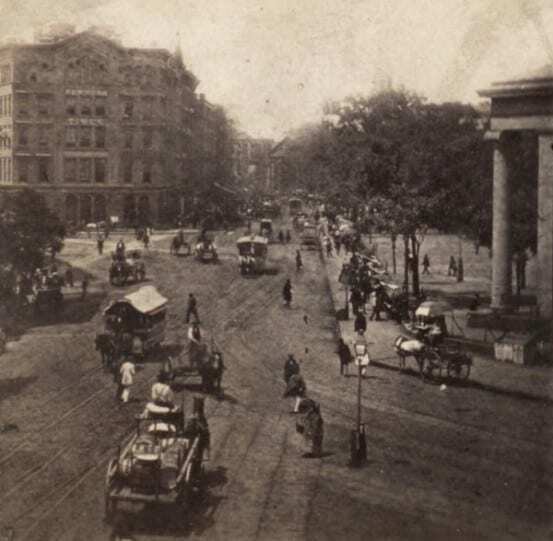 Downtown service used the shorter cars, and Tryon Row served as a point of change for people heading north in the longer cars. 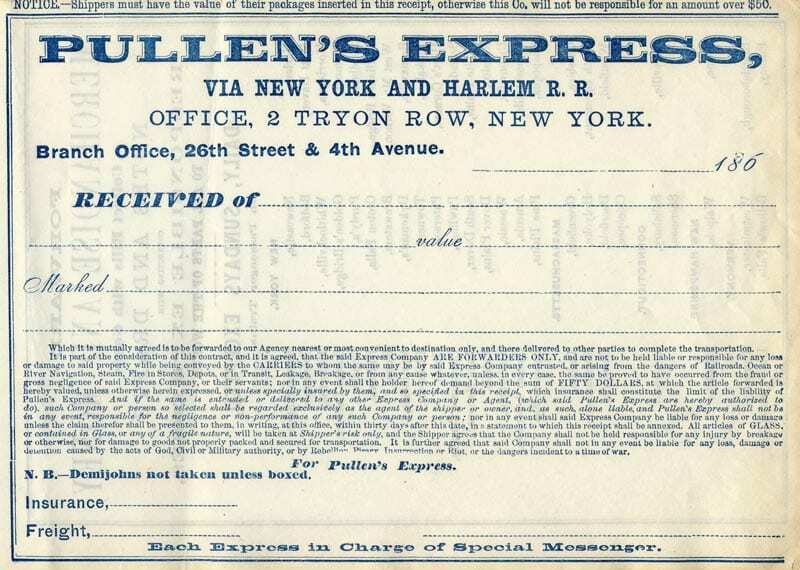 The station also housed a place called Pullen’s Express, from where you could send packages or money to be carried over the Harlem. I happened to find a rather interesting artifact recently – an example of the form a customer would fill out to use the service in the 1860’s. 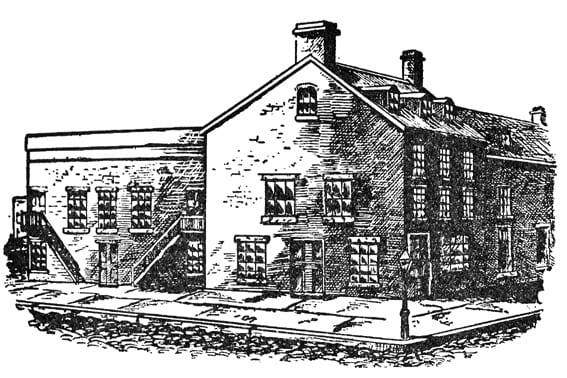 While the front of the form lists the office at Tryon Row, which is pretty cool on its own considering it is a very early Manhattan station, I happen to be a big fan of the back. 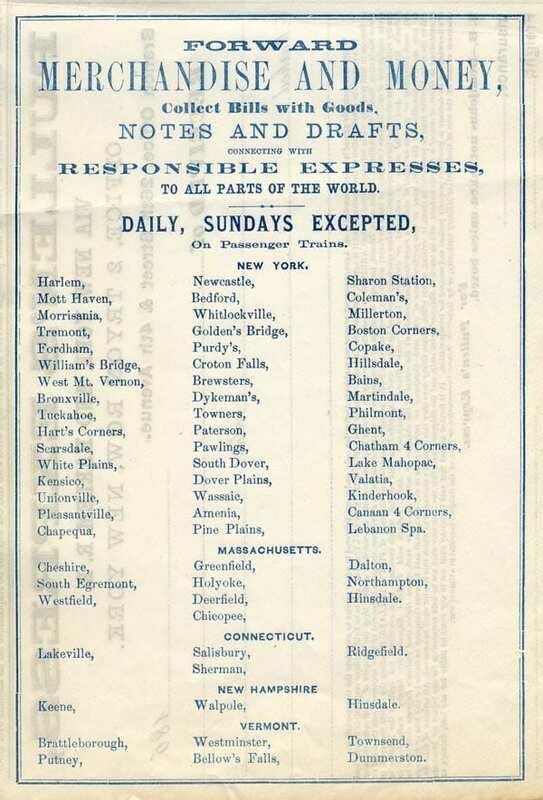 The back lists all the various places in New York, Connecticut, Vermont, and New Hampshire that one could send money or goods. Many of the named places are Harlem stations, but others happen to be random places that they could connect to – either by a different railroad, or by other means. I always love looking at old station lists for the Harlem though, as over the years the places and names have changed. Hart’s Corners became Hartsdale, Unionville became Hawthorne, Newcastle became Mount Kisco, Whitlockville became Katonah, South Dover became Wingdale, and Bains became Craryville. Chappaqua is listed as “Chapequa,” a spelling I had never seen before, but appears in various railroad printed material in the 1860’s and 70’s (and by modern-day idiots that can’t spell and have not yet discovered google). Bedford hadn’t yet added Hills, and Brewster and Pawling went by Brewsters and Pawlings. I can’t get over all the commas after each station and a period after the last one, not to mention all the other (to me, extraneous) commas and periods. I have to think the typesetter must have had his knuckles rapped too many times by some overbearing teacher with a ruler in her holster. And if your story about Crestwood is anything like the other stories you’ve told me about stations, then no, I have no desire to know. 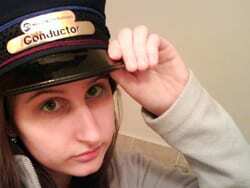 Who needs a job when you can have cake? 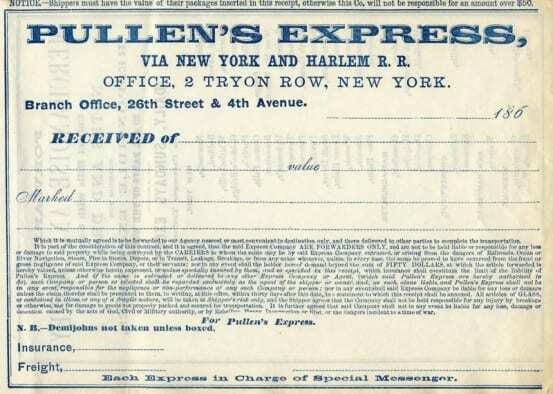 CG; I marvel at your unsurpassed abilty to aquire such scarce and rare vintage documents; it’s amazing that such a old and unusual document only peripheral to the Harlem RR even exists after such a long time-period. I hope your aquisition of such historical documents will never cease, and that we will perpetualy be delighted and astonished when you present your most recent “find” to us.